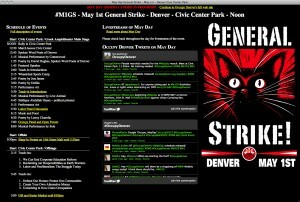 Occupy Denver's website is "on strike" with Twitter feeds, livestream locations, and Civic Center May Day schedule. Click above to visit the site. This was written by Denver General Strike Committee. Posted on Tuesday, May 1, 2012, at 7:06 AM. Filed under Strikes & Occupations. Bookmark the permalink. Follow comments here with the RSS feed. Both comments and trackbacks are currently closed.